Letter from Alan Cobham to Briggs Garage. Homepage. This page: A transcript of a letter received from the famed aviator (Sir) Alan Cobham, in the 1920's. 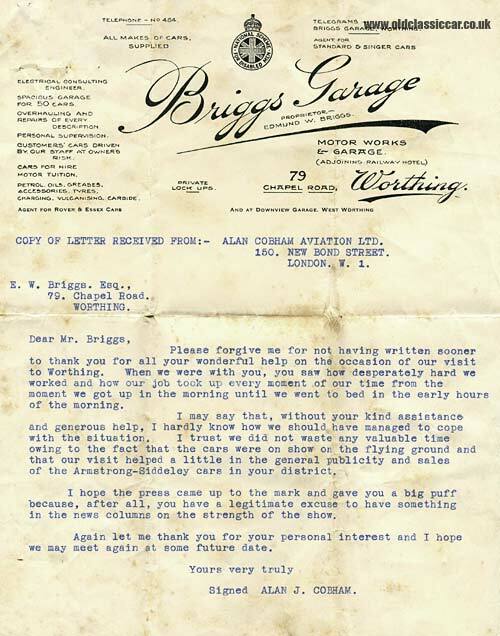 Alan Cobham's letter to Briggs Garage of Worthing. This letter, on "Briggs Garage" headed paper, dates to the late 1920s or early 1930s, and is it seems a contemporary transcript of a letter sent by famous aviator Alan J. Cobham to the garage following assistance he received from them at a show. Unfortunately no precise date is given, nor a clear hint as to which event he was referring to, other than that it was at a flying ground, it incorporated a motor show, and must have been in the vicinity of Worthing. Quite why Cobham's letter was copied onto Briggs' headed paper isn't clear either. Briggs had two premises in Worthing, one adjoining the Railway Hotel at 79 Chapel Road, and the other at Downview Garage in West Worthing. They could supply all makes of car, and were official sales agents for Standard, Singer, Rover and Essex motor-cars. The logo at the top centre of the letterhead is for the National Scheme For Disabled Men, a scheme whereby an employer guaranteed to employ a percentage of disabled ex-Service men, at a time when disabilities often precluded any hope of regular employment. Please forgive me for not having written sooner to thank you for all your wonderful help on the occasion of our visit to Worthing. When we were with you, you saw how desperately hard we worked and how our job took up every moment of our time from the moment we got up in the morning until we went to bed in the early hours of the morning. I may say that, without your kind assistance and generous help, I hardly know how we should have managed to cope with the situation. I trust we did not waste any valuable time owing to the fact that the cars were on show on the flying ground and that our visit helped a little in the general publicity and sales of the Armstrong-Siddeley cars in your district. I hope the press came up to the mark and gave you a big puff because, after all, you have a legitimate excuse to have something in the news columns on the strength of the show. Again let me thank you for your personal interest and I hope we may meet again at some future date. Yours very truly, Signed Alan J. Cobham. So where might this aerial event have taken place? Shoreham seems like a good bet, as it is close to Brighton, Hove and Worthing. Plus, a historical write-up on the Shoreham Airport website confirms that Alan Cobham held a number of his aerial displays at airfields across the UK, including Shoreham. From 1932 until 1935 he toured with what would end up being known as "Cobham's Flying Circus", a troupe comprising aerobatic pilots, wing walkers and other dazzling aerial displays. A page on a website documenting the history of Findon village also refers to Cobham's exhibition flying at Shoreham and the surrounding villages and towns in that area, in the early 1930's. In 1926 this pioneer aviator was knighted, yet in this correspondence he modestly doesn't draw attention to his knighthood, simply signing himself Alan J. Cobham.